Upper panel: Double labelling of PfRON6 with AMA1 PF11_0344 in segmented schizonts. Confocal microscopy using anti-rPfRON6-B with anti-AMA1 (microneme marker). EM: Electron micrograph of immunogold staining using affinity purified anti-rRON6-C antibodies. Arrows indicate PfRON6.Right panel: Localisation of PfRON6 during the asexual red blood cell (RBC) cycle. 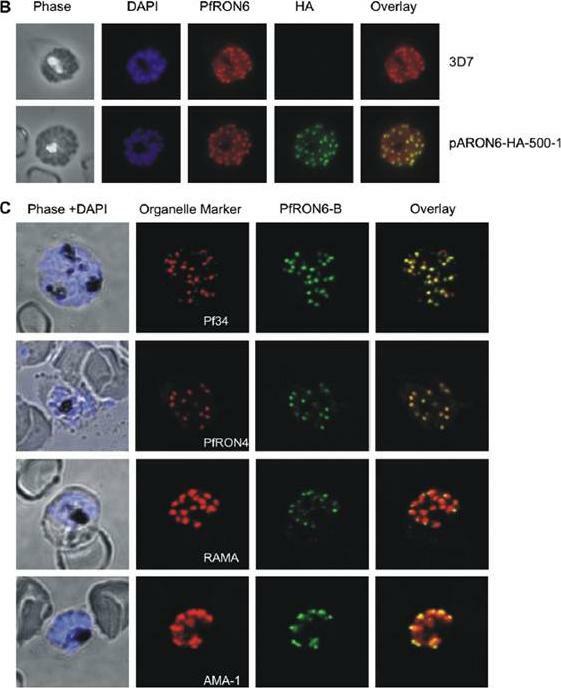 Immunofluorescence microscopy using anti-rPfRON6-B antisera and DAPI on parasites at different stages of the asexual RBC cycle. The corresponding phase contrast images are shown.Proellocks NI, Kats LM, Sheffield DA, Hanssen E, Black CG, Waller KL, Coppel RL. Characterisation of PfRON6, a Plasmodium falciparum rhoptry neck protein with a novel cysteine-rich domain. Int J Parasitol. 2008 39(6):683-92. Copyright Elsevier 2009. Localisation of the PfRON6 protein in parasitised red blood cells. (B) Double labelling using anti-rPfRON6-B and anti- haemagglutinin (HA) in HA-tagged transgenic parasites. Confocal microscopy using anti-rPfRON6-B with anti-HA. Corresponding overlay images are shown. (C) Double labelling of PfRON6 with Pf34, PfRON4, RAMA or AMA1 in segmented schizonts. 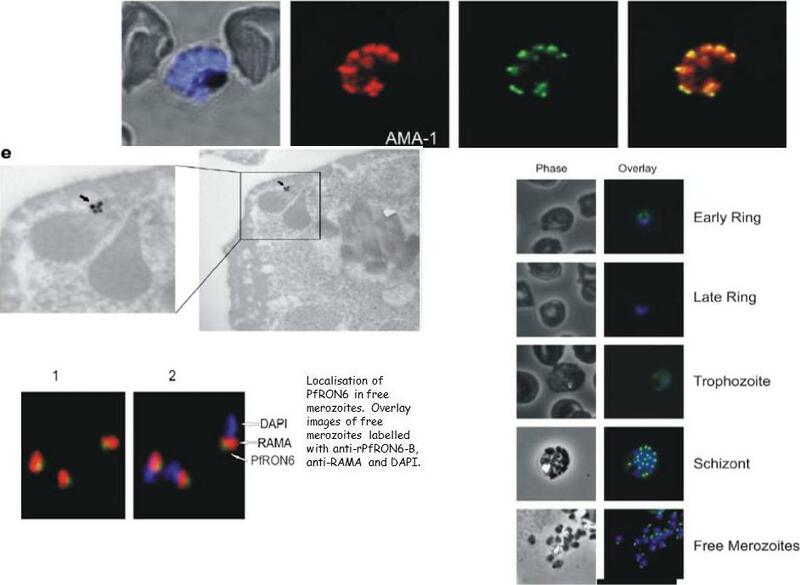 Confocal microscopy using anti-rPfRON6-B with anti-Pf34 (rhoptry neck marker), anti-PfRON4 (rhoptry neck marker), anti-RAMA (rhoptry bulb marker), or anti-AMA1 (microneme marker). Corresponding overlay images are shown. a punctate pattern of fluorescence in segmented schizonts characteristic of localisation with the apical secretory organelles.Proellocks NI, Kats LM, Sheffield DA, Hanssen E, Black CG, Waller KL, Coppel RL. Characterisation of PfRON6, a Plasmodium falciparum rhoptry neck protein with a novel cysteine-rich domain. Int J Parasitol. 2008 39(6):683-92. Copyright Elsevier 2009.